This model comes with an ice cream paddle and patent-pending gelato/sorbet paddle. With the first one, you can create soft and smooth ice cream or yoghurt, while the second one gives richly-textured results with intense flavour. The unit is rather bulky. 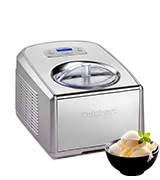 This fully automatic Cuisinart ICE-100 ice cream and gelato maker will quickly create your favourite frozen treats batch after batch. In only 10-60 minutes, you'll be able to enjoy tasty homemade desserts. The open lid design allows for aeration of the ice cream while churning. This makes your home-made ice cream more airy with a wonderful mouth feel. A rather fragile plastic lid. 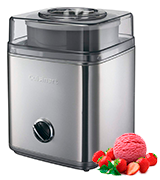 Using Cuisinart ICE30 ice cream maker can help you make ice cream on a daily basis with a minimum effort. Pre-freeze the bowl and it's ready to go. 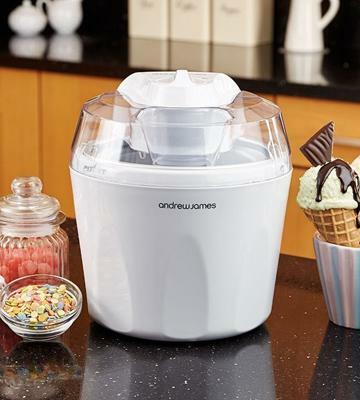 Requiring 8 hours only on pre-freezing, Andrew James ice cream maker can be used every day. A compact design is another feature most customers praise a lot. The bowl is easier to clean when it's heated up to the ambient temperature. 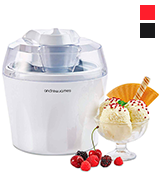 Andrew James AJ000014 is an excellent choice for those customers who make ice cream at home for the first time. A recipe book can help create a lot of new delicious masterpieces. Thanks to the anti-stick coating on the inside of the freezer, you can get all the ice cream out with no fuss. The container, its lid, and the mixing arm are machine washable. Needs careful drying up before putting the container back inside. Pleasant to the eye, durable, easy to use, functional. The timer will help you keep the ice cream frozen even after the whole process is finished. A high-performing unit that only needs 10W of power to work. You can cook your favourite desserts every day, sparing bills little to no thought. The fingerprints are visible on the black glossy body. This semi-automatic ice cream maker with a timer allows you to mind your other business as it cooks. Top-shelf user-friendliness, there is even an opening in the lid to add ingredients without having to lift it. 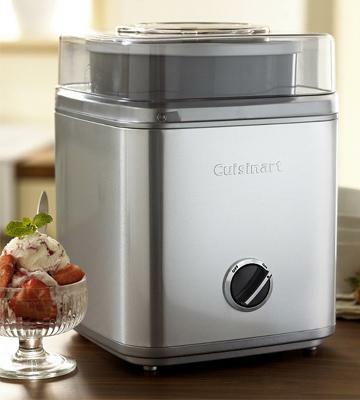 The Cuisinart ICE-100BCU is a heavy-duty ice cream and gelato maker that is ideal for big families and those who often host big parties. 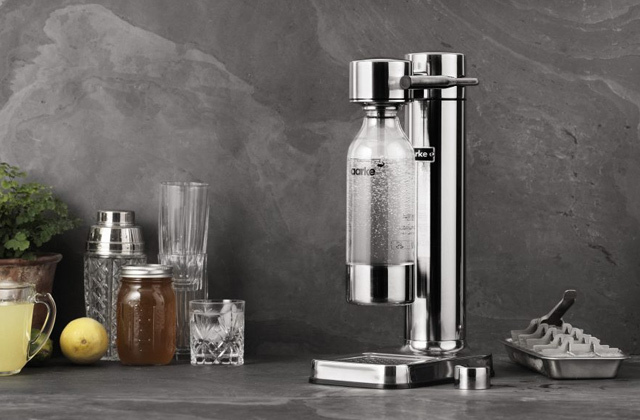 It boasts a commercial-style compressor which freezes ice cream and other treats while also mixing them. The major selling point is that the machine comes with two mixing paddles - one for ice cream or frozen yoghurt and the other for sorbet or gelato. 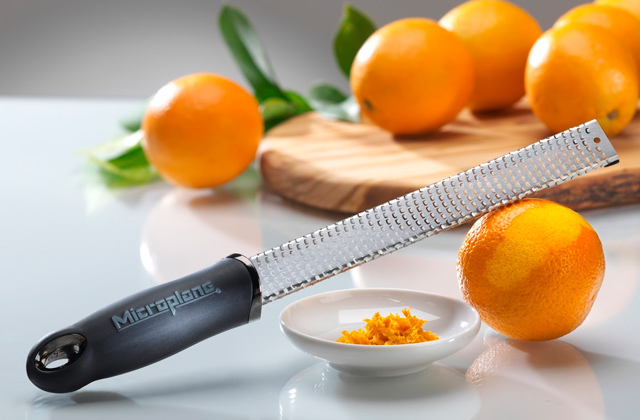 These two paddles can mix and aerate the ingredients in different ways. The dasher for churning gelato or sorbet brings less air into your mixture, creating richly textured desserts with intense flavour. The other dasher enriches ice cream with more air to give it a lighter and fluffier consistency. Both mixing paddles rotate evenly, blending and aerating all ingredients perfectly for silky texture without ice crystals. 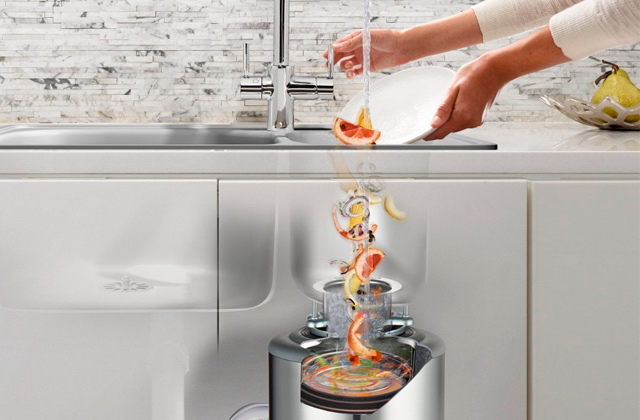 The lid of the appliance is fully transparent so that you can watch the mixing process in action anytime you want. Also, there is an additional mix-in opening on the lid, allowing you to add different toppings, chocolate chunks, nuts, or fruit without interrupting the freezing process. The powerful motor along with a high-quality freezer can whip up a whole batch of ice cream in less than an hour. 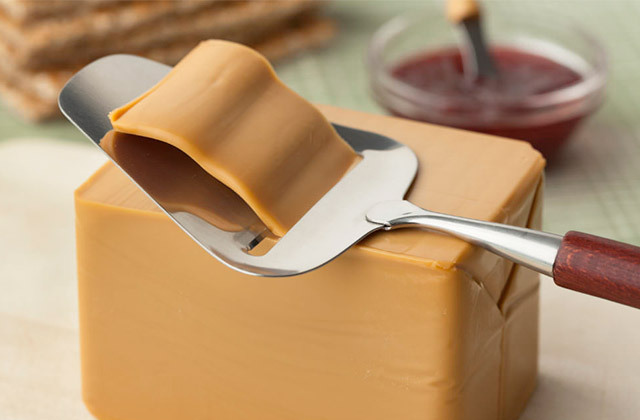 The dessert gets very smooth and extremely creamy. So, if you need an incredibly easy-to-use, capacious, and quick machine for making creamy desserts for big companies, the Cuisinart ICE-100BCU is a perfect option. Surprising family with new treats and desserts can be quite challenging at times. A lot of people simply have no time or opportunity to cook on a daily basis. However, if there is something that you should be willing to do daily it would certainly be home-made ice cream. All people, both children and adults alike, are big on ice cream and won't get bored even if they ate it every day. 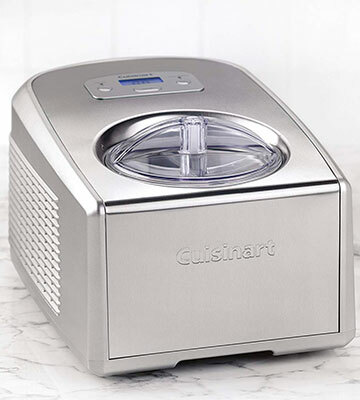 If you like the idea of treating your dear people to soft and delicious ice cream, then we recommend you consider buying the Cuisinart ICE30. 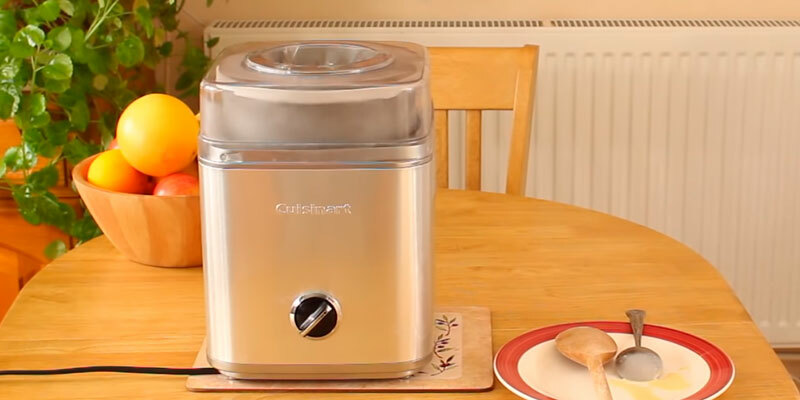 This perfect ice cream maker allows you to make any frozen dessert in less than half an hour, which is impressively quick. Besides ice cream, you can also prepare about 2 litres of frozen yoghurt or sorbet in it. Families who've got kids would definitely praise this option. The Cuisinart ICE30 is very easy to use, though, like many other ice makers, it requires a bowl pre-freezing (about 12 hours). Rather than that, it's all simple and straightforward. The open lid design provides aeration of ice cream while mixing, making the dessert much more airy and fluffy. It also allows users to add more ingredients during the process. If you plan to use your ice cream maker quite often, make sure you have got all necessary ingredients. Macadamia nuts, for example, can bring a peculiar nutty flavour to your ice cream desserts. Many people who have a small kitchen cannot afford to buy a new kitchen appliance as they simply lack countertop space. If you have the same problem, what you should do is turn towards a space-saving solution like the one produced by Andrew James. 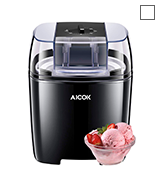 The AJ000014 ice cream maker will allow you to prepare delicious homemade desserts and won't take up a lot of your working space. 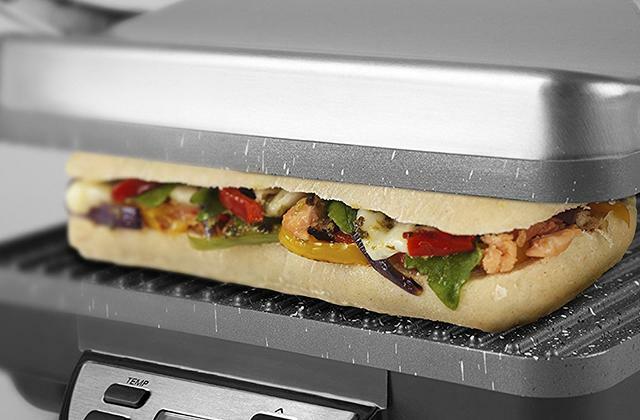 Due to its small footprint, you will not even need to store it away in a kitchen drawer. 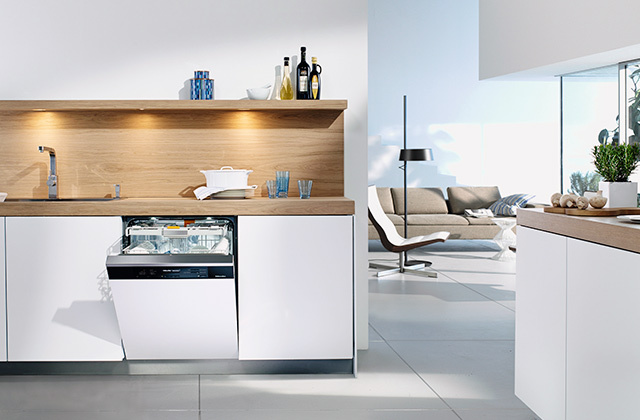 The appliance is so compact and neat, you will love keeping it in plain sight. In addition to compact size, the AJ000014 has a very lightweight construction due to its plastic design. All of these make it possible to take it away with you when you go on a picnic somewhere and decide to treat your friends to yummy frozen desserts. 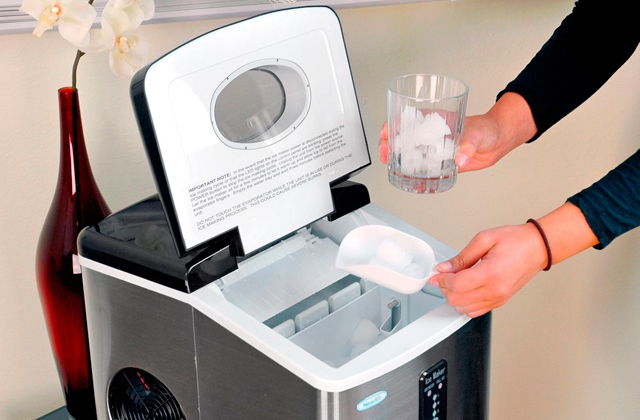 All parts of the ice maker are dismountable for easy clean-up, you'll never have a problem cleaning it after use. 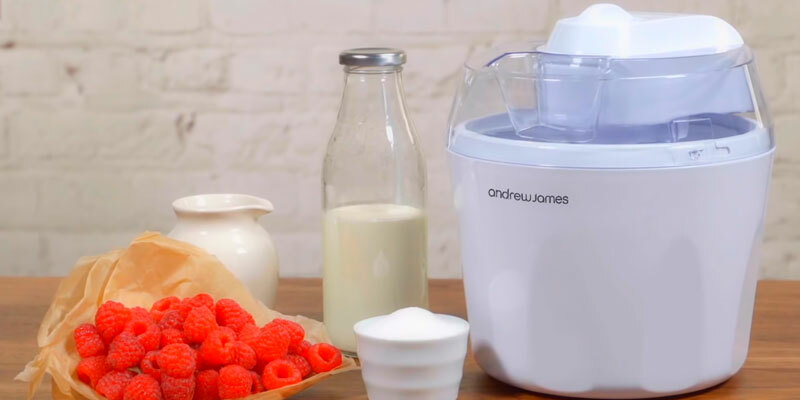 So, if you're looking for an ice maker to prepare ice cream at home, and you want it to be small but decent quality, don't look any further, the Andrew James AJ000014 ice maker is the right thing. At an attractive price like this, you can get a new kitchen appliance and please your family with healthy and wholesome desserts that contain no artificial ingredients and taste just great! The kitchen and food scale will help you measure your ingredients accurately. This Springlane Kitchen Ice cream machine is a cute and compact addition to your household collection that will make your family and friends love you even more than they already do. 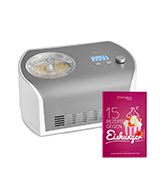 It is a 1.2-litre device and it will offer you ice cream, yoghurt, or sorbet within 45 minutes of time. The coolest thing about this little girl is that you do not need to spend time on cooling the container since there is a compressor built in. As a result, the stated 45 minutes of preparation indicate exactly that, 45 minutes. The container for ice cream is removable for easy use: instead of carrying the whole machine around or having to bring the glass ice cream cups from the house each time, you can get the container out and set it somewhere cool for your kids or guests to take when they want. It even has a handle. 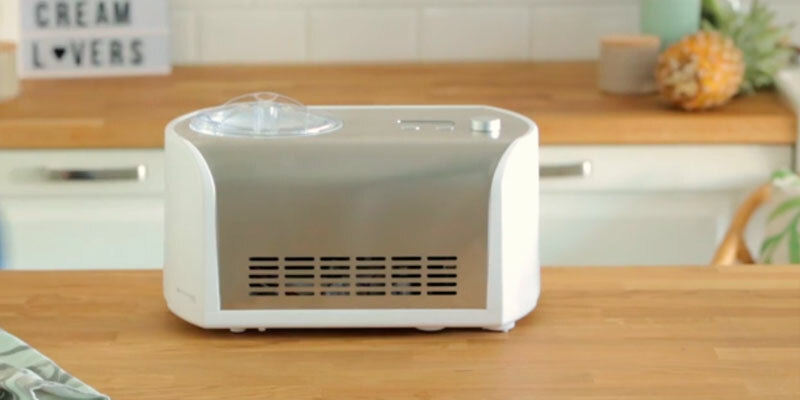 Also, as an added convenience, the lid for the ice cream maker has an opening where you can add ingredients at any stage of the process without having to remove the lid completely. It is exceptionally convenient if you think about it. The device is equipped with a display where the temperature and the remaining time is shown. The rotary knob right beside it is for simple intuitive setting if you want to adjust it. This is a dream machine for any ice cream lover. The first thing that comes to mind as you see this not-so-little machine is that it looks stunning. The glossy body, either black or white (we prefer black, to be honest), will be a gem of your kitchen during hot summer days. There is the issue with fingerprints on the housing because clearly everybody will want to touch it immediately upon seeing but well... isn't it a minor drawback? Look at it. And the functionality does not disappoint either so it's not all about visuals. 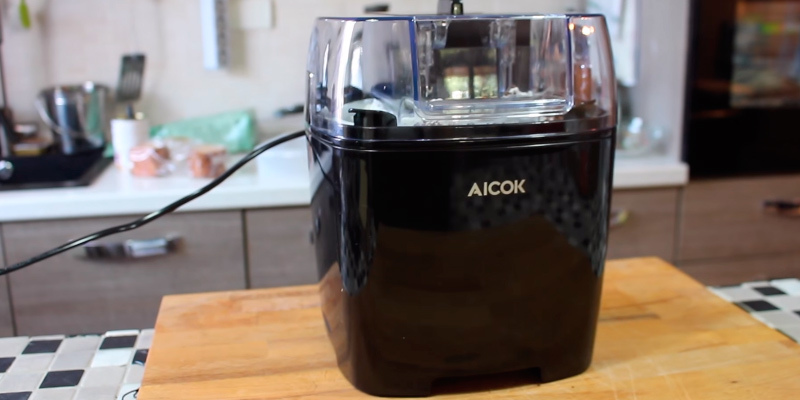 The Aicok is a 1.5-litre ice cream maker and one of the fastest one to boot. It will take approximately 15 to 20 minutes for your delicious treat to be ready, be it ice cream, yoghurt, or sorbet. Though the timer knob on the top can be set anywhere from 0 to 30 minutes. To make the desserts evenly frozen, the bowl is made with double insulation, the wall filled with liquid. As you put it in the freezer to pre-freeze the night before the party (at least 12 hours are needed), it will spread the cold over the whole surface. There is a recipe book included with the machine where they tell you how to make the most popular ice cream types. You can, of course, experiment and create your own unique recipes by adding your favourite ingredients. Make it a family bonding event or a fun party with friends, there is little in the world that enamours people with each other better than creating something new together does. 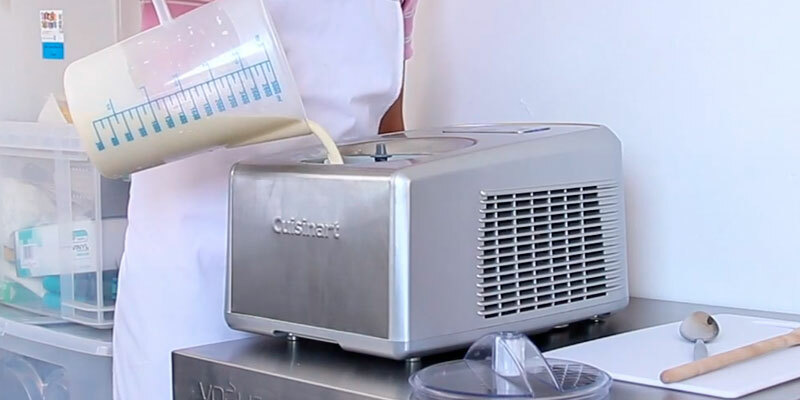 An ice cream maker is a home appliance designed to make homemade ice cream. However, this appliance can be used not only for making ice cream, in fact. You can make a good share of other delicious frozen desserts in it, including milky cocktails, chilly fruit beverages, sorbets, delectable gelatos, and many others. The working principle of an ice cream maker is based on a churning action and aeration so that the mixture you make freezes evenly and without ice crystal formation. This way all desserts, as well as ice cream, turn soft and have a nice, slightly porous texture. Aside from ice creams, you may also want to try to cook home-made candy floss. 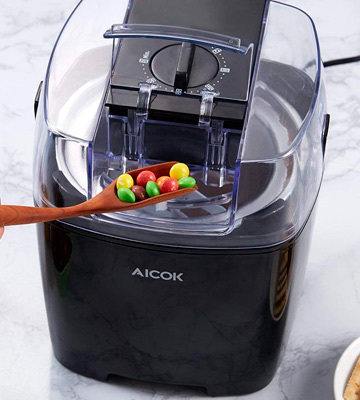 For that, we'd like to offer you to get one of the candy makers that we've picked out from hundreds of units available. We also assume that most of the customers searching for an ice cream maker would love to get themselves an ice maker, too. 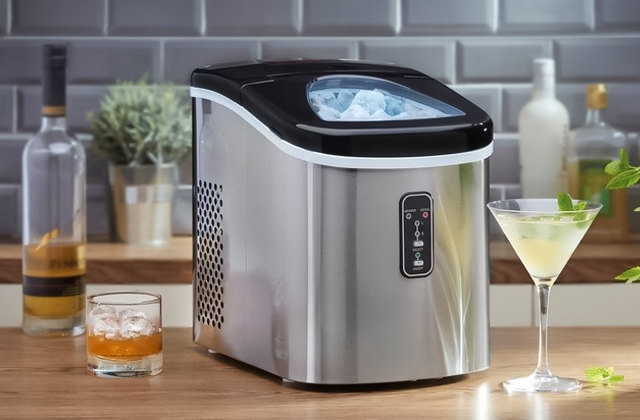 With this appliance, you will not need to shop for ice cubes elsewhere and will always be able to make them at home. When choosing an ice cream maker, the first thing to consider is the operation principle, which primarily depends on the freeze method. It should be noted that the earliest ice cream makers were hand-cranked. Thus, to make some ice cream you had to stir the mixture manually every 2-3 minutes. Currently, these machines are out-of-date and replaced by semi-automatic and automatic ice cream makers. To use a semi-automatic ice cream maker, you need to pre-freeze the bowl in the fridge prior to use. This method of making ice cream is called Freezer Bowl. The freezing time is generally up to 8-12 hours. To make the next batch, you have to wait until the bowl freezes again. There are also semi-automatic ice cream machines that require no pre-freezing of the bowl in the fridge. You just need to add ice and rock salt between the bucket and the inner bowl. This is the so-called Salt and Ice method. Salt and ice lower the freezing temperature, therefore, the temperature of the mixture around the ice cream gets colder. On the contrary, automatic ice cream makers are more convenient as they require no pre-freezing or adding ice and salt. 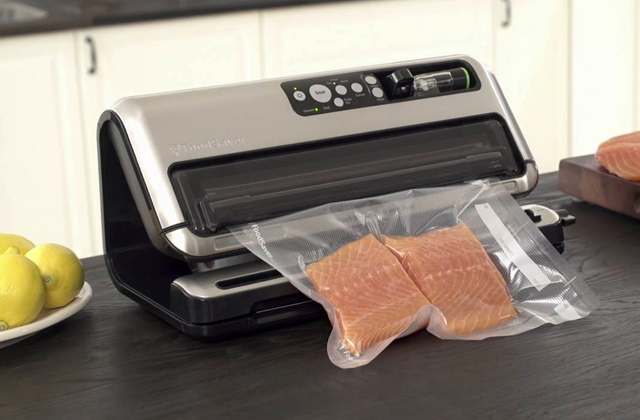 Although, such models are more pricey as they feature a built-in refrigeration unit. 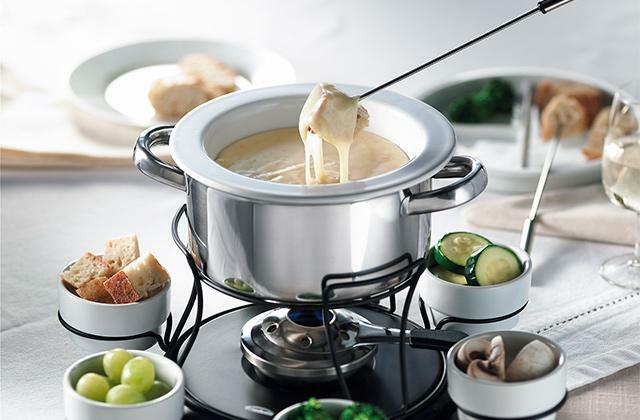 It's very easy-to-use - just turn the electric motor on, wait for 5-10 minutes until the bowl is frozen to the desired temperature, pour the prepared ice cream mixture, and get the ready product in a short while. The other thing we’d like to draw your attention to is ice cream maker's capacity, which is mainly determined by a bowl capacity and freezing time. There are models with smaller and bigger freezer bowls so you can choose the one to fit your family needs. As a matter of fact, the overall amount of ice cream depends on bowl capacity. A freezer bowl of 1/1.5-quart capacity will be surely enough for a small household. However, if you are planning a dinner party, you should choose an ice cream maker with at least 4/6-quart bowl capacity. While churning the mix, ice cream gets saturated with air and becomes fluffy. The time required for freezing usually varies between 20-60 minutes (depending on the chosen model and the amount of product you need to produce). And finally, you should pay attention to the usability of an ice cream maker. In fact, ice cream makers are quite easy to handle even for inexperienced users. Actually, you should press the on/off button on the front control panel, or simply plug your machine in. 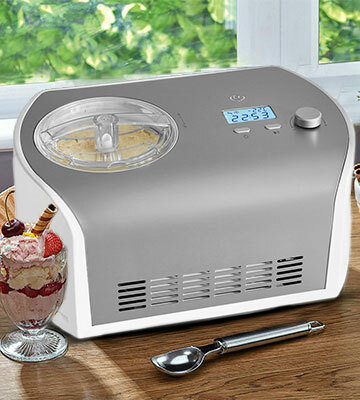 Some ice cream makers come with an LCD display with a number of handy features like a built-in timer, various temperature modes, a pause option, etc. Next, when selecting an ice cream maker, it's reasonable to choose a compact and lightweight appliance that can be easily stored or transported. Besides, you should pay attention to the material a bucket and a bowl are made of. Ice cream makers can be manufactured from high-quality plastic that makes them lighter. If an ice cream maker is made of metal, it is considered to be more solid and durable. 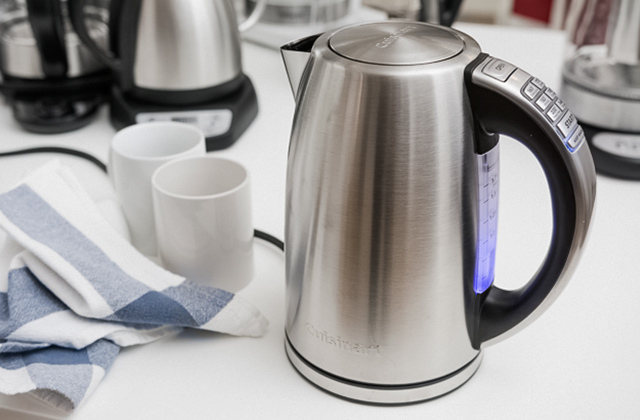 Meanwhile, the inner bowl is typically made of stainless steel or aluminium that ensures better absorption of the cold. Furthermore, a reliable lid adjustment prevents ice and rock salt from getting into the bowl and spoil your frozen dessert while rubber feet on the bottom of the bucket keep the base stationary, providing safe use of the appliance. 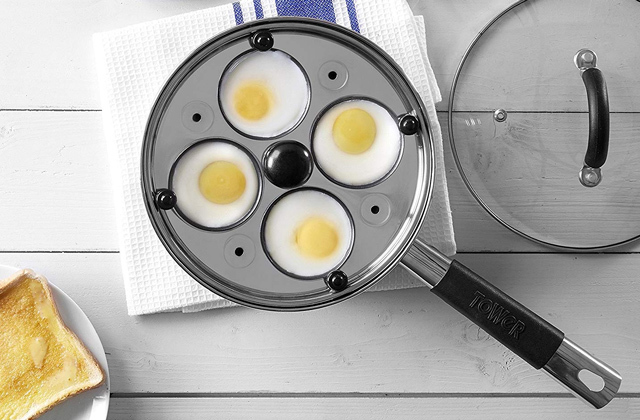 To sum up, all these useful features can make your cooking experience really enjoyable. 1. Nicole Weston How to choose an ice cream maker, Baking Bites. August 1, 2013. 2. How to buy the best ice cream maker, Which? 4. Ice Cream Maker Buying Guide, Abt. 5. 10 Tips for Homemade Ice Cream Success, Seriouseats.